This week's theme for the 40 Great Nail Art Ideas challenge is Weddings. I suspect you will see a whole bunch of french manis, pastels and pretty, delicate (and usually white) stamping. At least that is what I usually think of when I think of wedding nails. Certainly when I got married I had a simple french mani, mind you that was nearly 19 years ago folks! If I were to get married now day's I'm sure I'd have a much fancier, and certainly a much blingier mani. Anyway, onto my nails for today's theme, and let me tell you I'm really loving the ideas behind this one, because so many things just came together. First let me start with saying it is actually our wedding anniversary in three days, so the timing of this prompt couldn't be more perfect for me. A June wedding in Australia is pretty unusual, because it's winter here, and not many people get married in winter. 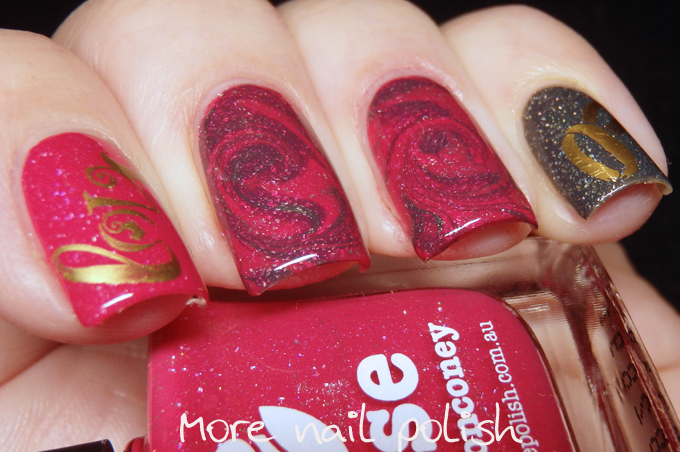 Next, let's look at the two polishes I used in this mani. 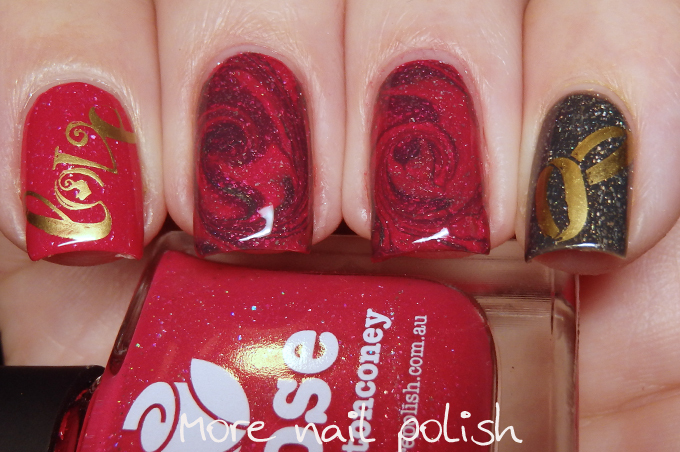 Picture Polish Rose and Winter. 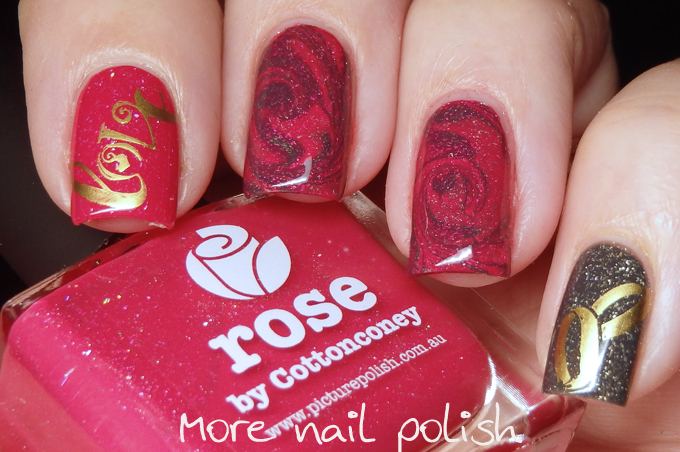 I just received Rose in the mail last week, which again was perfect timing for this mani. I chose to wear Winter with it, because we got married in Winter and cause it's a charcoal black. Finally, and the bit that I love that pulls it all together, my bridesmaids and I all held red roses and whilst I wore a classic white wedding dress, my bridesmaids wore black slinky dresses with thigh high spits and gold lace up accents. We also had a black wedding cake with red roses on it. 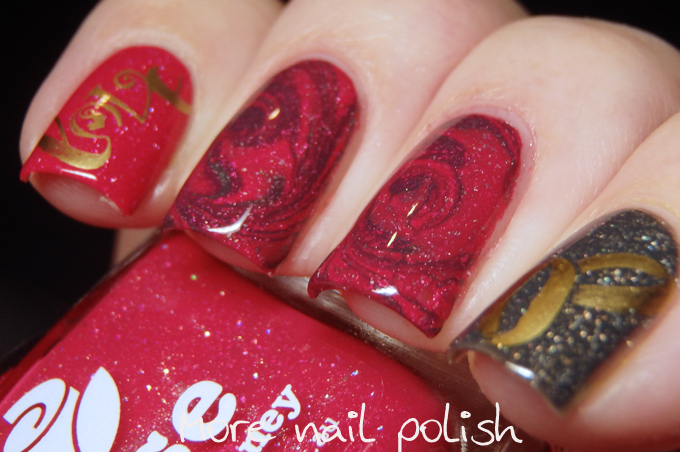 So for my mani, I attempted a circular water marble with Rose and Winter, some I've seen in the past look amazing and just like the center of a rose. Mine weren't exactly that, but they were close. My pinky finger had Winter on it stamped with some gold wedding rings off the Bundle Monster Holiday plates and my index finger was painted with rose and the word 'love' stamped in gold. My thumbs, not shown here were a gradient of winter and rose. 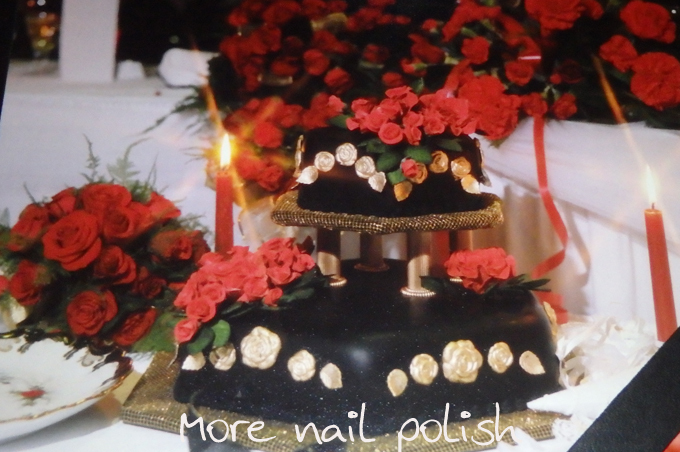 So here you have it, my 'winter rose' mani that matched my wedding rose bouquet, black bridesmaid dresses and black and red rose cake for our winter wedding. Here is a photo of our wedding cake. Only the very outside of the cake was black, there was regular icing under it, covering a chocolate mud cake. There were red icing flowers on top, and gold roses on the sides. The photo quality ain't great, because I had to take a photo of this photo in my wedding book. It's so funny to think that digital cameras didn't exist when we got married so we only have prints and negatives. OMG I feel so old!!!! Wanna see what we looked like way back then, check out this blog post from 5 years ago.